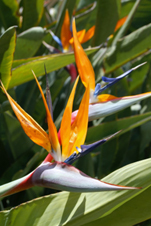 Bird of Paradise plants add exotic elegance and dramatic color to interior décor and outdoor landscapes. The best known species of the bird of paradise plant is Strelitzia Reginai. This plant is native to South Africa, and can be planted year round in USDA zones 9 through 11. The exotic blooms emerge from the end of stiff stalks that grow in clusters. The leaves (6” wide, 12-18” long) of the strelitzia reginae are leathery, bluish-green in color, and oblong in shape. 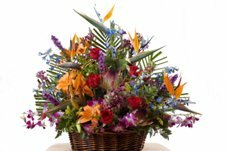 The bird of paradise plant is a popular choice for tropical flower arrangements, bouquets, and centerpieces. The dramatic flower is typically used as a focal point for indoor floral displays. Before arranging, re-cut flower stems and remove excess foliage. Place stems in a mix of warm water and floral preservative a few hours prior to completing arrangement (or overnight). Arrangement should be placed in a location free of direct sunlight, heating and air conditioning vents, and drafts. Remove any dying blooms and foliage, and water daily. Change water and re-cut stems every 4-5 days. Bird of paradise flowers are heavy – be sure to provide extra support for stems if necessary. The bird of paradise plant requires 5-6 hours of direct sunlight and moderate humidity (60 %). Note: Curling leaves and decreased blooms indicate insufficient light. During warm months, expect plant to grow and flowers to bloom. Keep soil moist and mist plant daily with distilled water. Fertilize every two weeks. During cool months, expect slow growth and minimal blooms. The bird of paradise plant may even become dormant. Keep soil moist and mist 1-2 times a week with distilled water. Fertilize once a month. If re-potted, this plant may not bloom again for 2-3 years. The exotic bird of paradise plant is an evergreen perennial that grows in warm, humid climates, and is ideal for outdoor landscapes. Their exotic blooms add colorful elegance to landscape designs, and their large, showy leaves do not drop from the plant, making care and maintenance a breeze. Strelitzia reginae can be planted year round in hardiness zones 9-11. This plant will thrive when planted in rich, organic soil with good drainage. Be sure you choose a location that receives direct sunlight to light shade. Dig a hole 2-3 times the diameter of the root ball. Note: The hole should be as deep as the root ball is tall. Place the root ball in the hole – the top of the root ball should be visible at the soil surface. Fill in the hole with soil. Note: Water the plant during the planting process to prevent air pockets. Form a basin around the plant to hold water until it drains down to the roots of the plant. If you are planting more that one root ball, be sure to space the plantings greater than six feet apart. Remove dead leaves and old flower stalks to keep plant healthy. Place a 3-4 inch layer of mulch around the base of the plant to conserve moisture and prevent weed infestation. Apply a slow-release fertilizer every three months to full grown plants. Water frequently during warmer temperatures. During colder months, water when the soil is dry.